North Yorkshire is the largest county in England with huge areas of open countryside, two National Parks and has huge potential for birds of prey and other wildlife. Unfortunately, the county continues to be in the news for all the wrong reasons. Recently there have been reports about a string of illegally killed red kites and a gamekeeper controversially cautioned for setting three pole traps. This is built on a depressing history of the county having the worst record in England and Wales for confirmed raptor persecution incidents during the last 20 years or more. So perhaps this latest dark tale should come as no surprise. The telling has had to wait a while because of legal proceedings which concluded yesterday. In December 2014, in company with my colleague Howard, I attended a useful meeting with the North Yorkshire Police (NYP) and the Yorkshire Dales National Park about raptor persecution issues. It was this meeting that led to NYP putting out their wildlife poisoning message the following spring using this poster. After the meeting we had a few hours to spare. I recalled a photograph I had seen on a website a few years earlier showing a cage trap in a small plantation on Hurst Moor on the East Arkengarthdale Estate, an area managed for driven grouse shooting, not far from Richmond which seemed worth a check. Checking crow cage traps is a regular part of our work. There had been a buzzard poisoned by alphachloralose not far away back in 2007 and prior to this incident, during a chance visit to the area I had seen an unidentifiable individual get out of a very distant Landrover and take a pot shot at a passing sparrowhawk which fortunately continued across the moor unscathed. So like much of upland North Yorkshire it seemed that birds of prey were not particularly welcome. On this occasion as we entered the plantation we found the cage trap was dilapidated and no longer in use. In our usual way we started to look around the small plantation looking for anything out of the ordinary. My colleague Howard was a few metres away when I saw him crouching down. A tiny piece of blue plastic had caught his eye amongst the pine needles which quickly revealed itself as the edge of a lid set on top of a bucket buried in the ground. As I reached Howard I saw him just starting to raise the lid and could see the bucket set in the ground and that it held a large plastic container. I immediately had my suspicions as to what this was – an illegal pesticide cache? I quickly got Howard to put the lid back down so we could discuss tactics. For people involved in enforcement there are often certain types of crime which are of particular interest. For a detective, it may be solving a murder case, for a Scottish police officer I suspect it could be catching an English egg collector! In my area of wildlife crime finding somebody responsible for a pesticide cache is high on the wish list. 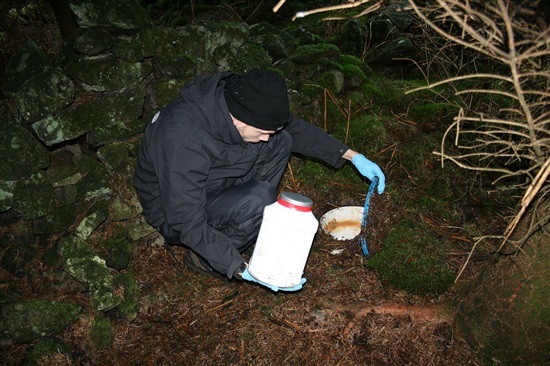 Over the years from intelligence and a number of detailed conversations with gamekeepers I was well aware of the practice of hiding away pesticides in a secret location in order that they could be available when needed for preparing poisoned baits to control predatory birds and animals. Illegal wildlife poisoning is a cruel and insidious practice that continues to blight our countryside. A range of products, several long since banned, continue to be regularly abused for this purpose. A pesticide amnesty in Scotland last year gave another disturbing insight of just how much of these dangerous products may be stashed away. A pesticide cache was not something I realistically ever expected to come across in my career, so now we were presented with a fairly unique set of circumstances and needed to decide what to do. It seemed we had basically two choices. Report what we had found to the authorities or try and ascertain who was visiting this remote location. The first would mean an initial problem of trying to find a statutory agency who would be prepared to pay for the analysis, but more significantly practically zero chance of establishing who was actually using the cache. The second choice meant installing some surveillance equipment to try and catch someone visiting the site. However, this was December and as the peak poisoning period is typically later in the spring we thought it could be a while before somebody turned up. Our job is primarily about catching people to highlight the problem and to try and create a deterrent climate. Only a fraction of these crimes are ever discovered and from these there are very few opportunities to get cases to court. When they do arise it is important to make the best use of them, so we decided that surveillance was, on balance, the best option. A significant proportion of prosecutions for raptor persecution come from just this type of evidence including the recent jailing of a gamekeeper in Scotland for illegally trapping raptors. We did not have the equipment with us and were concerned if we left to get this that the evidence may go missing. Taking a tiny sample seemed a sensible precaution. We obviously didn’t know what the container might hold and had to consider it could be highly toxic so health and safety considerations were paramount. 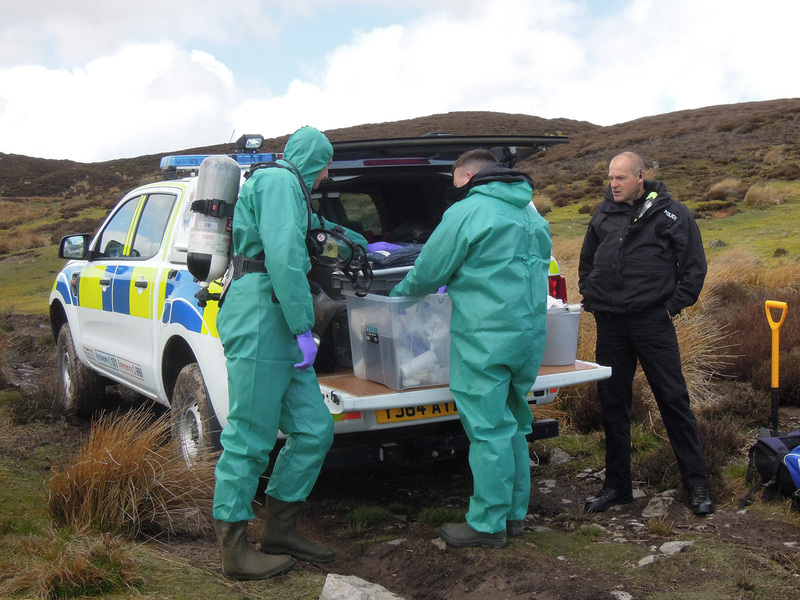 Fortunately amongst our well equipped field rucksacks was a forensic sampling kit and suitable protective nitrile gloves. Having got ourselves ready, we carefully opened the cache taking video and photographs to document the process and opened the container. This held a significant quantity of a whitish powder. We decanted just a few grams into a small sealed forensic container and carefully put everything back together to hopefully make the cache user completely unaware of our visit. The sample was submitted to the Fera toxicology laboratory the following day. The surveillance presented particular problems. This was a remote site, and a suitable route to get in and out would be about seven miles. We decided to install an older camera system which was motion activated and took a pre-determined number of still images. Whilst not as good as video footage, it was far less power hungry and so required less maintenance. Unfortunately, the equipment was not immediately available and we had to once again call on the services of our in-house technical gurus. Once everything was ready it was just before Christmas when we set off to install the equipment. As the three of us were dropped off in the morning the weather was horrific with horizontal rain lashing across the moor - a real Yorkshire welcome!. Three rather bedraggled and windswept figures eventually arrived on site. Our first surprise, something had been added to cache - there had been a visitor and it wasn’t Santa! A second smaller plastic container was now inside the bucket. Again we carefully took a few grams of this product and put everything carefully back in place. The camera system was installed, and whilst annoyed having missed the chance to catch our unknown visitor, we were hopeful that perhaps another visit may now come sooner rather than later. Our hopes came to nothing as a number of visits to maintain the equipment during some tough winter weather showed no signs of any activity. After a few initial teething problems with the equipment it seemed to be working reliably. After leaving the area, we had a regular routine of calling at Scotch Corner to undertake an initial review of the images over a hot drink. Whilst nobody made an appearance on our images, we were at least entertained with some candid moments of a range of wildlife visiting the area around the cache – this included rabbits, a stoat, various passerines, a pheasant, a sparrowhawk, a tawny owl and a woodcock. All very nice but not really what we were after. We were starting to get a little despondent but finally on the 16 March 2015 our hopes were raised. Arriving on another bitterly cold day it was clear the cache contents had been moved, there had obviously been a visit! Arriving back at Scotch Corner we anxiously reviewed the footage – and, finally, there he was visiting the cache some four days earlier. However, as is often the case in these enquiries, it appeared lady luck was not on our side and we had not got quite the outcome we wanted for our considerable efforts. We had anticipated any suspect would probably enter the plantation by one of two styles and approach the cache side on. However, it appeared he had climbed over the fence and walked in with his back to the camera. He arrived shortly after midday and removed the large plastic container before returning to replace it a few hours later. There were only brief views of his face. Though probably sufficient, we decided to let the last camera run play out in case we got some better images and then report the matter. 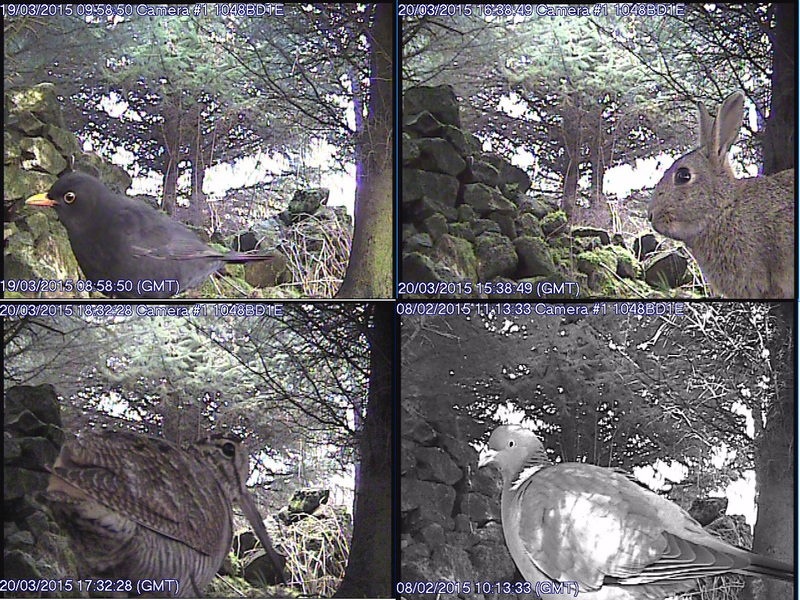 I was away for the final visit in April when my colleagues found there had been another visit. Firstly the small plastic container was now missing but in its place was a sachet of a pesticide called Ficam W. This is an approved insecticide, however the active ingredient in this product is the pesticide bendiocarb. During the ten years from 2004 to 2013 this has been the third most abused pesticide in wildlife poisoning cases relating to birds, accounting for around 10% of incidents. Why anybody with a legitimate use for this product would want to store it in an unlawful manner in a secret hole in the ground raised serious concerns about its intended purpose. Annoyingly lady luck seemed absent again and the camera system, after many weeks of reliable service, had stopped working after about ten days and we had missed the person depositing the Ficam W and removing the smaller plastic container. We reported the matter to the North Yorkshire Police and had an excellent response with manpower quickly assigned to investigate the matter. Based on our intelligence and our images, the police identified a local gamekeeper as the potential suspect.. Natural England (NE) was brought on board and two of their most experienced staff quickly got organised and made the long drive up from Cambridgeshire to assist one of the local NE officers. They suspected the larger plastic container may have held the banned fumigant Cymag. This gives off the highly toxic hydrogen cyanide gas when brought into contact with moisture. It was legal for gassing rats and rabbits, though had a notorious reputation for illegal use against foxes and badgers. It was banned way back in 2004. So we were all set and two teams were despatched. One went to the address of the gamekeeper where various items were seized including an electronic calling device with an interesting selection of raptors and predatory birds. These devices can be used for legitimate pest control, such as calling in foxes so they can be shot. However, the use of an electronic calling device to lure birds to be taken or killed is unlawful unless licensed. Consequently, the presence of the bird calls on the device was obviously of concern. There was also a secure pesticide store legally holding various work related pesticides. 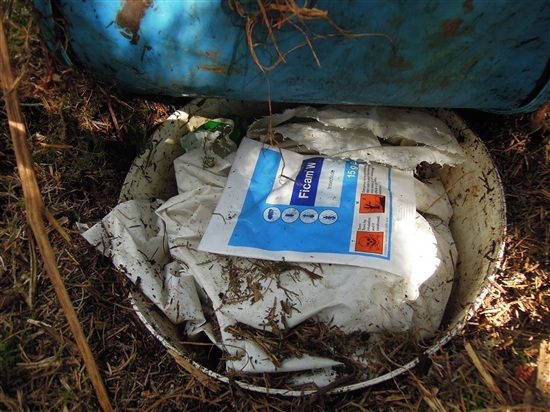 The other team went to the cache site and recovered the sachet of Ficam W. On site testing by NE using specialist equipment confirmed the contents of the large plastic container were indeed the banned product Cymag. With the identification confirmed, NE were then able to arrange the safe disposal of the product. When interviewed the gamekeeper went no comment. Later analysis of the small sample we had taken from the missing smaller plastic container confirmed this as alphachloralose. This has consistently remained as the second most abused product in wildlife poisoning, with around 17% of all bird related incidents during the ten year period previously mentioned. So there we had it - alphachloralose and bendiocarb, numbers 2 & 3 in the hit parade, and a significant quantity of Cymag. A really nasty toxic arsenal of products. After the good work by the police and NE, and as the enquiry unfolded, we were hopeful the matter would proceed to court. However, ultimately in 2016 the CPS was not prepared to take the case forward. In additional to some procedural concerns re the handling of the calling device, the main issue was that they were not satisfied with the identification of the man caught on camera. Unusually, on this occasion, we didn’t share their views and felt there was enough for the matter to be put before a court. However, the CPS has the responsibility for making often difficult decisions and so on occasion you have to accept that there may be a difference of opinion. After a lot of challenging and physically demanding work from our end, this was a rather disappointing outcome to put it mildly. How long the the cache site may have been there and what any contents may have been used for we will probably never know. These types of investigations continue to demonstrate the serious problems that remain in our uplands and just how difficult it is to get the standard of evidence needed to get those involved to court. North Yorkshire Police has recently taken over the wildlife crime portfolio, with Chief Constable Dave Jones currently holding the reins, and it is clear there is still much work to be done in his own county as well other parts of the UK. In relation to this enquiry, RSPB would like to take the opportunity to express its thanks to the officers of North Yorkshire Police and Natural England who responded to this incident. Also to raptor worker Dave Anderson who provided expert evidence on sound calling devices and those trusty scientists at Fera who provided their usual excellent work in undertaking the toxicology tests on the seized pesticides. However, that wasn't quite the end of the tale, as North Yorkshire Police seized the gamekeeper's firearms and revoked his firearm and shotgun certificates revoked. This can be done where a licensing officer is satisfied that the licence holder is of intemperate habits or unsound mind, or is otherwise unfit to be entrusted with such a firearm. This was contested and resulted in a short hearing in Teeside Crown Court yesterday, which I attended with a colleague. The gamekeeper was represented by barrister Peter Glenser and whilst RSPB evidence had been accepted, as we had turned up, he decided he may want to cross examine us preventing us from watching proceedings. Unsurprisingly, neither of us was called. I was later informed that during the hearing there had been criticism by the gamekeeper's barrister of some of the work of police and Natural England, but, not surprising, the RSPB had come in for the most of the abuse. Of rather more interest, was that apparently it had been accepted that it was the gamekeeper who had placed the Cymag and the Ficam W in the cache. When I asked about the alphachloralose - I was greeted with rather a blank look. In the file of evidence the firearms department had been passed, following the failure of the criminal case, there was apparently no mention of alphachloralose. It certainly was there, because the analysis results on the small sample we took say so (see 104/007 on the 2015 spreadsheet). So quite how the alphachloralose got into the cache, where it subsequently went and why it didn't even get a mention in court remains a bit of mystery. We sat in at the end of the hearing whilst the Judge gave his ruling, which went in favour of the gamekeeper. He outlined the grounds where a revocation can take place and the concerns raised by the police about the pesticides and the calling device. He said the original enquiry had been compromised by the amateurish way in which the evidence had been gathered. In relation to our part, I would have liked the opportunity to explain the difficult situation we had been presented with and why we thought our decisions were reasonable in the circumstances. Anyway, the Judge stated the decision by the gamekeeper to store the two pesticides at this location was a stupid thing to do, but did not think it amounted to intemperate habits or an unsound mind. Despite the act of stupidity, he felt the revocation of the firearm certificates was disproportionate and a strongly worded warning would have been sufficient. He allowed the appeal and made no criticism of the police for bringing the action. The most surprising part of the hearing was when the Judge addressed the gamekeeper direct. He told him he owed a debt of gratitude to his legal team and needed to watch his behaviour in the future. He mentioned that he walked in the countryside himself and carried a bird book with him, adding "I detest people who kill raptors". He stated that during his visits to the countryside he would be keeping an eye on this estate. So some fairly thought provoking comments to finish. The concerns of North Yorkshire Police as to whether somebody who, despite having an appropriate pesticide store at his home, hides dangerous and banned pesticides in a hole in the ground and has raptor calls on a predator control device is a fit and proper person to hold firearms I believe is entirely understandable and we are grateful for their work in this case. However, for me the real question is what on earth in this day and age are dangerous pesticides, all with a history of abuse in wildlife poisoning, doing sat in a secret cache in the middle of a driven grouse moor and who is ultimately accountable for that. That is the question on which society really needs to focus.